Steve Newman answered the request for an interview about his 60 years of life and four decades of touring as a guitar player with characteristically twinkle-eyed humility: “Cool, bra, should be interesting from the bus”. This was no chrome-plated tourbus, although Newman is no stranger to those either, after criss-crossing the globe as a solo artist, with the seminal Afro-acoustic outfit Tananas and with long-standing guitar collaborator Tony Cox. It was a simple Roadlink bus, crawling its way from Cape Town to Johannesburg – Newman does not drive a car and is content to travel by the most economical means when circumstances demand it. The image of one of South Africa’s most critically celebrated musicians tucked on a bus inching its way through countless roadside stopovers hammers home the reality of Steve Newman’s four decades in the business. When artists pursue the integrity of their vision and their craft, even though success and growth and opportunities will come, it does not necessarily hold that riches will follow – especially if their art is not aligned with current commercial trends. 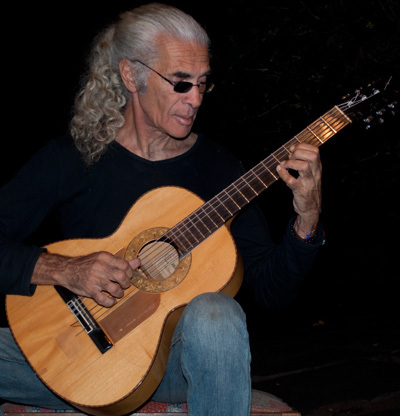 Newman is both sage and grateful about what he calls his “gypsy” life – creating and performing music across the world as a solo artist and with carefully selected collaborators, living as as dedicated yoga practitioner and vegetarian, and raising a family on a farm he has built into a model of eco-sustainability. What, then, does the sprightly sexagenerian, think about music, and life, in contemporary South Africa? “Musically, I’d like to see a change in this country, from Americanised sounds and lyrics and acts, back to the really unique and original stuff which we have here,” he says. “We’ve got loads of really excellent musicians in South Africa but, at the moment, it seems to be going through a phase where everything is following trends from somewhere else. We’re hoping that places like the new Ibuyambo in Cape Town will be like the old Base nightclub used to be in terms of audience – very cosmopolitan. Audiences can still be very segregated if you play in certain areas, and I have always found that a mixed audience is way better to play to.” “As for living, we’ve got lots of space here in South Africa and we need to decentralise our country,” he continues. “We need to get more eco-villages and so-called intentional communities happening. It’s a natural thing, too – it’s happening already and a lot more people are interested in this kind of lifestyle. Things have changed more in South Africa than some us would acknowledge. Some of it is good, some of it is bad, but us gypsies carry on regardless.” Steve Newman co-founded South Africa’s first globally touring contemporary Afro-acoustic trio, Tananas, in 1987, which went on to become a staple of Peter Gabriel’s globe-trotting WOMAD festivals. In addition to his solo shows, he co-founded and played with groups like Mondetta featuring vocalist Wendy Oldfield, the Aquarian Quartet with the late Syd Kitchen, “World In A Guitar” and “Road Warrior” with guitarist Tony Cox, Strings ‘n Skins with tabla-player Ashish Joshi, Man Walking with Kaolin Thomson and, more recently, creating In The Clouds with multi-instrumentalist Greg Georgiades and All In One with Cape Town’s own Errol Dyers and Hilton Schilder.